General Motors has invested in a Chinese technology company that has built a service for arranging short-term car rentals, part of a broader push by the automaker to expand beyond its roots. General Motors said Tuesday it has invested an undisclosed amount in Yi Wei Xing Technology “as another move in exploring personal mobility in China.” Yi Wei Xing is the company behind Feezu, a service that can be used by traditional car rental companies to rent cars by the hour or in even smaller increments. GM said the investment would help it experiment with different car rental models, gain insights into China’s rapidly changing market, and better learn how people want to use transportation to get from point A to B. In January, GM introduced a service called Maven that combined and expanded several of automaker’s existing test programs under one brand. 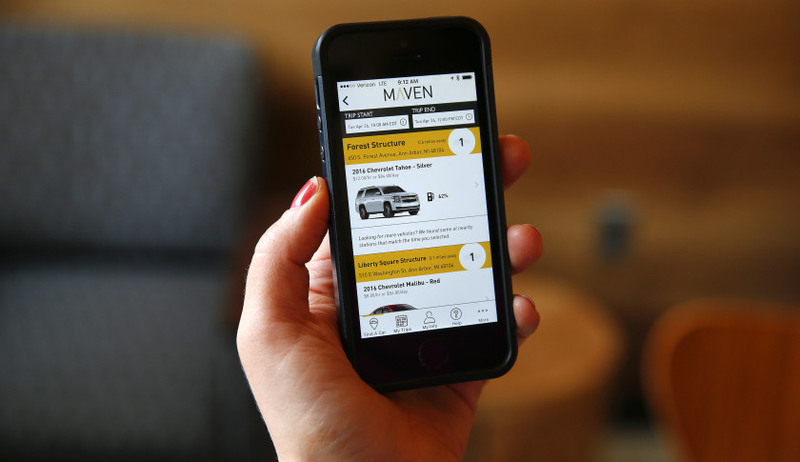 Maven is really three car services in one that includes a city-based service called Maven City that rents GM vehicles by the hour through an app, another for urban apartment dwellers, and a peer-to-peer rental service that started in Germany. Maven operates in Ann Arbor, Mich., Boston, Chicago, San Francisco, and Washington D.C.
General Motors has announced several initiatives this year that highlight its interest in unconventional transportation, including a partnership and $500 million investment in ride-hailing startup Lyft. Eventually, GM wants to develop a network of self-driving cars for Lyft’s service that can shuttle passengers around town without a driver. GM and Lyft started a short-term car rental program known as Express Drive, launching first in Chicago and then expanding to California and Colorado. Express Drive’s California members will have access to the plug-in electric 2016 Chevrolet Volt and the 2017 Chevrolet Bolt EV. GM is hardly the only automaker experimenting with new kinds of car and transportation services, and how they may be combined with self-driving car technology. GM’s more than $1 billion acquisition of self-driving car startup Cruise Automation in March kicked off what would become a flurry of investments and acquisitions by others in the automotive industry. In the past six months, Apple invested $1 billion in China’s ride-hailing company Didi Chuxing; Ford acquired a shuttle service startup that used crowdsourcing to determine where people needed rides; Toyota partnered with Uber; and Volkswagen invested $300 million into ride-hailing company Gett. Both BMW and Daimler operate services that let drivers rent cars by the minute. This entry was posted in General News, Rental Car Relocation Advice and tagged car relocation, car rental, general motors by Sheldon Nesdale. Bookmark the permalink.